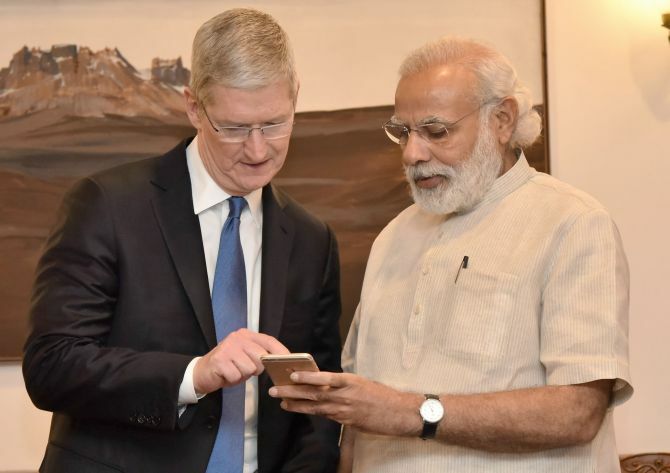 Apple CEO Tim Cook met Prime Minister Narendra Modi on Saturday and launched an updated version of the the 'Narendra Modi Mobile App'. The App contains a new feature 'My Network' that will consist of thoughtful forums where App users can share their ideas, views and deliberate with a wide range of people. Several daily tasks would also be put in this section at a very regular basis. "Cook shared Apple Inc's future plans for India. He spoke of the possibilities of manufacturing and retailing in India. He appreciated the breadth of young talent in India and said the youth have significant skills which Apple would like to tap," an official statement said. “Thank you @tim_cook! Friends, welcome & happy volunteering. Your views & efforts are always enriching,” Modi tweeted after meeting Cook. 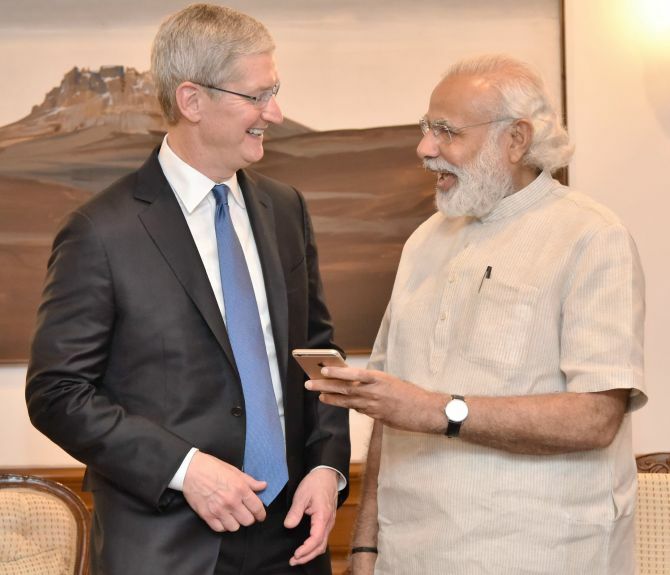 The PM shared a photo with the Apple CEO on his Twitter handle. 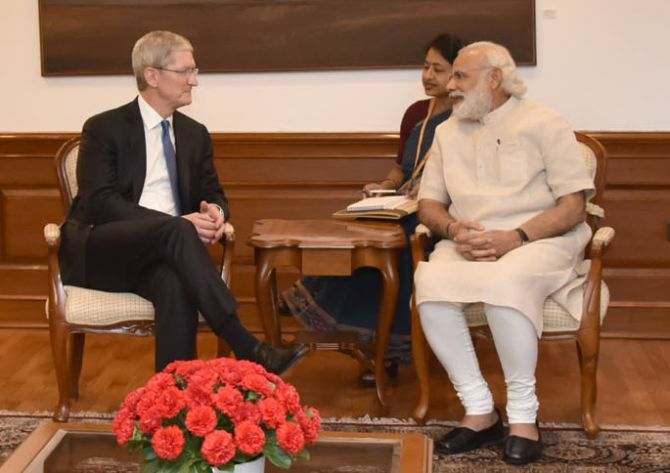 During his meeting with Modi, Cook highlighted the immense potential for app development in the country. He also launched an updated version of the PM's mobile app at the meeting. 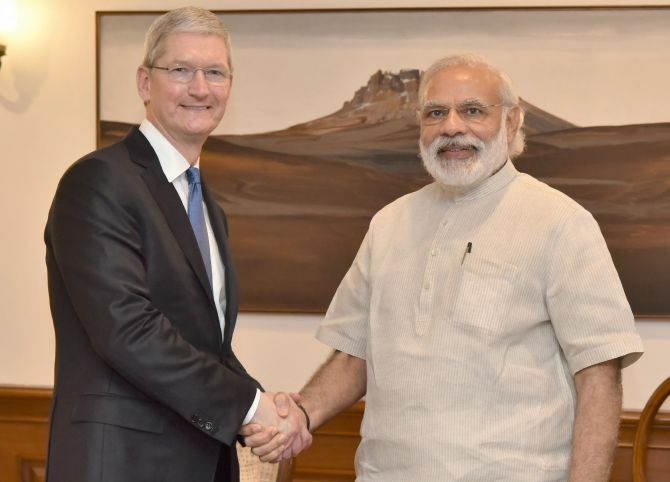 Cook met Modi as part of an Asian tour aimed at boosting sales. While smartphone usage is surging as the middle class swells, most Indians still can’t afford Apple’s iPhones and the company has only about 2% market share in a country where 100 million phones were sold last year. Modi, appreciating Cook, said in India "seeing is believing" and added these experiences would definitely steer his business decisions. 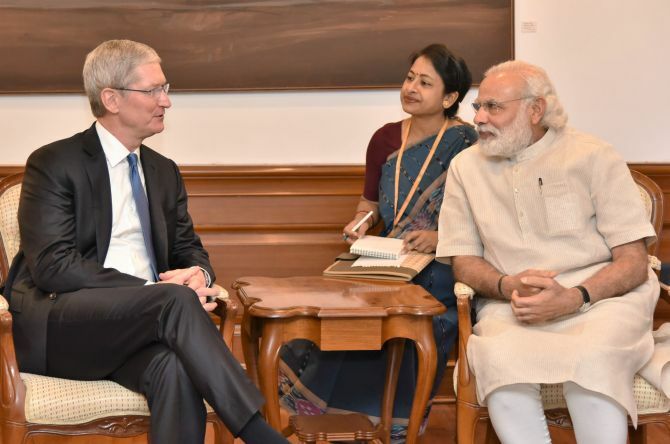 The Apple CEO’s visit to India comes at a time when the US technology giant is hit by slower growth in global sales of its flagship products and has his work cut out in a market that is growing fast. Cupertino-based Apple runs on 93 per cent renewable energy and Cook spoke of plans to move Apple's entire supply chain to renewable energy. On Wednesday, Cook began his first official visit to India by offering prayers at Mumbai’s Siddhivinayak temple, where he also met Anant Ambani, the son of Reliance Industries chairperson Mukesh Ambani. His meeting with PM Modi is the third and final leg of the 55-year-old Cook's visit to India, after Mumbai, Hyderabad and Kanpur.